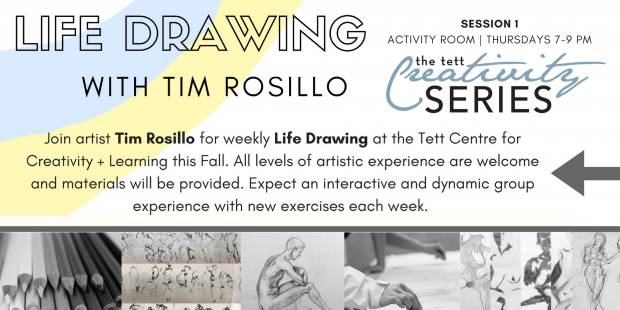 Join artist Tim Rosillo for weekly Life Drawing at the Tett Centre for Creativity + Learning this Fall. All levels of artistic experience are welcome and materials will be provided. Expect an interactive and dynamic group experience with new exercises each week. Please register online. Links below. NEW: Can't commit for 5 weeks? Choose the dates you want to attend. Register for each session via Eventbrite! $125.00 + fees | Registration includes all 5 dates.